As,I used to say that there's no rule in fashion//nothing right//nothing wrong//Wear your clothes with confidence//right place//right time//you'll look beautiful. So,don't let those XL,XXL screw your beauty..
* I don't recommend something tight. * Horizontal line//stripes//equals size expansion. * Next time, don't pick the biggest size on the rack (you feel sure that that one cover you enough..but it could be LOOSEy//LOSer, try the one that perfectly fit(not tight)..
* For those who gives up for HIGH LABELS//why don't you try to play fun with accessories instead. * Shoes with high heels probably increase your height, but wear it regularly..it effects health:Remember! Beauty + Healthy! * Don't compare yourself with one who is different,you can have your idol who is (for examples)skinny,nice legs,fashionista..blah..blah..blah, but you can't be the idol cloning.Just be yourself..
* Maxi skirt is not what suit you all the time.How about pencil skirt? If you are dreaming for mini skirt....Wake up!? 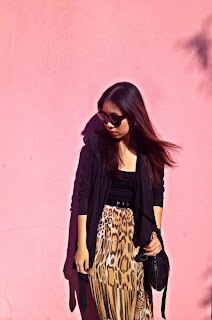 Make the length of a skirt a lil'bit higher up..
Bangkok/Australia based Personal Style & Fashion Blogger. Page 178 'n a little renovation!! © ::::INTIZ' JOURNAL:::: | All rights reserved.